Scrum Process Canvas, the scrum tool, provides you with quick access to sprint data. For example, you can simply click on the work item Daily Scrum to view and edit the daily scrum meetings within a sprint. Sometimes, you may want to view the data of an earlier sprint. To do this, you, switch the active sprint to the sprint you want to browse. Perform the steps below to switch to another sprint. You may try the steps interactively by visiting the interactive product tour. 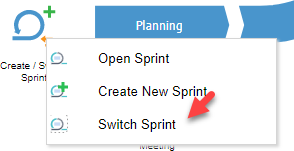 In the Scrum Process Canvas, click on the work item Create / Switch Sprint. Select Switch Sprint from the popup menu. This opens a window that lists out all the sprints of this project. Select the sprint that you want to browse its detail. The selected sprint has become the active sprint. The information of the active sprint is presented. Just go back to the Scrum Process Canvas via the breadcrumb. If now you click on a sprint-related work item such as Burndown Chart, you can view the burndown chart of the selected sprint. When you finished browsing this sprint, don’t forget to switch back to the working sprint to carry on your work.